It’s safe to say mornings can be the most hectic time of the day. With a big part of every morning spent getting ready, having a calm and organized bathroom could be just what you need to get your day started off on the right foot. It’s not just the mornings, though. 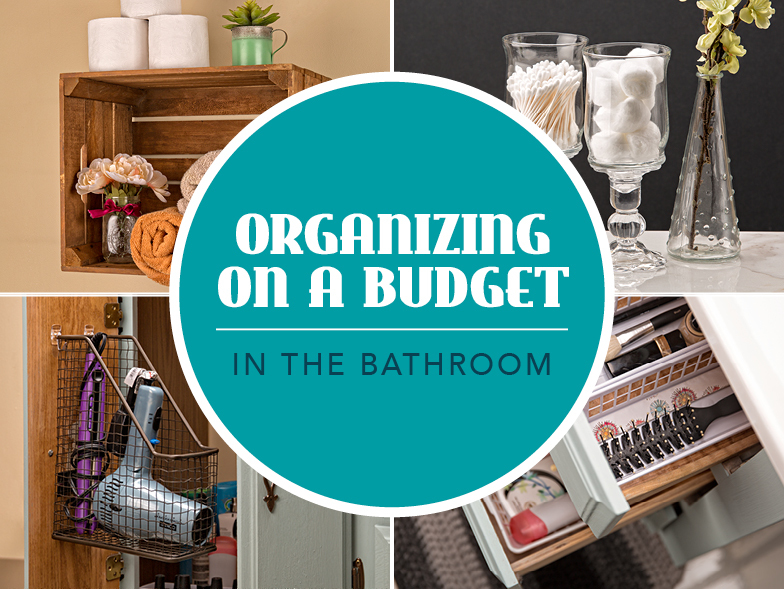 The bathroom is one of those often-overlooked areas of the home that could use some serious organization solutions. Yet, those decor and organization solutions can be pricey. 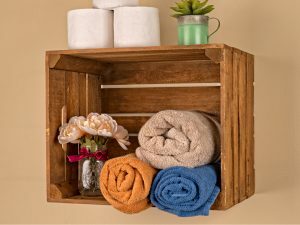 Use these inexpensive and fun DIY storage ideas to keep your bathroom organized and your mornings more pleasant. If you’re short on storage space, hanging some pretty woven baskets or upcycled drawers on the walls can be the perfect solution. This makes a great space to store extra towels or toilet paper, and it keeps items at eye level. Use this space to display items both beautiful and functional. Apothecary jars are beautiful but pricey. 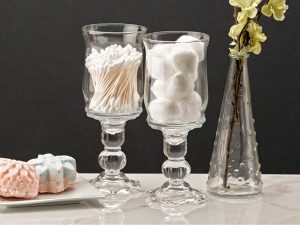 cheaperorganization_jarsYou can make your own by gluing a jar or vase to the top of a candleholder, and you’ve got instant storage for small items like cotton balls or makeup brushes. Paint the candleholder in a fun accent color to really make a statement piece. No place to house your curling iron, cheaperorganization_cabinetstraightener, and blow dryer? 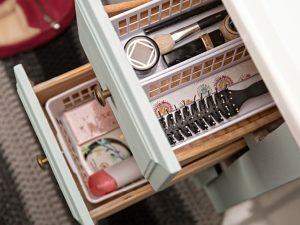 Hang a file box on the inside of your lower cabinet door for an ingenious space to hold your hair tools. 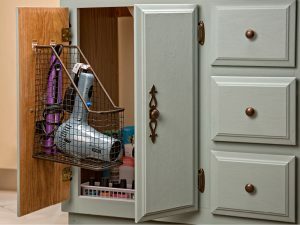 This trick not only keeps tools out of sight but also keeps them easily accessible and organized. For more Great Ideas contract The Annette Yorks Group we offer a professional Stager that can help with your organizing needs!